Dr. 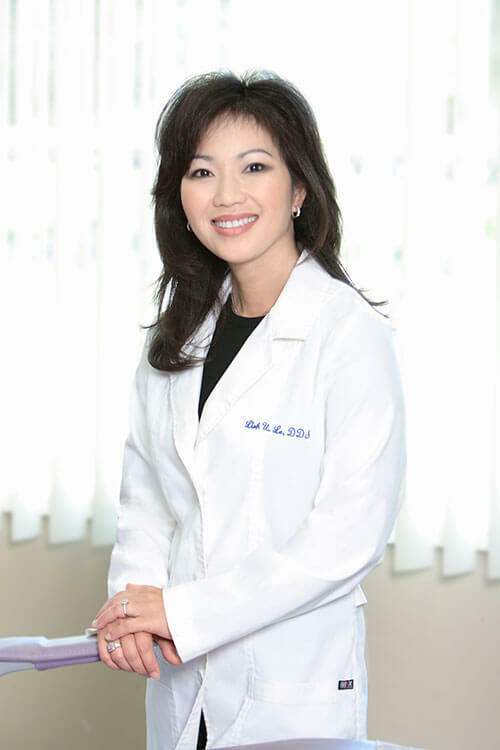 Le and her dental team are here to help educate and motivate you about your oral health and how to keep your teeth healthy and beautiful for a lifetime.Â Routine dental cleanings, check up and preventive in office and at home care is a vital part of maintaining optimal dental health. Our office is equipped with digital x-rays that can reduce dental radiation by 50%.Â These are small sensors placed in the mouth that capture details, rarely visible on regular x-ray film. We recommend scaling and root planning to patients who present to our office with bleeding gums in the presence of mild-moderate bone disease.Â Â Our office has been utilizing these techniques in the last 20 years to improve and eliminate gum and periodontal disease, without the need for surgery.Â Â Patients are usually numbed for comfort so that the hygienist can thoroughly clean out all bacterial infection, plaque, calculus and debris BELOW the gums, that are main culprit of periodontal disease and teeth loss.Â We will usually recommend additional bacterial specific antibiotics, antimicrobial irrigation and rinses after to maximize healing.